Aloha Tower Marketplace is Honolulu's exciting new venue for community meetings and gatherings. 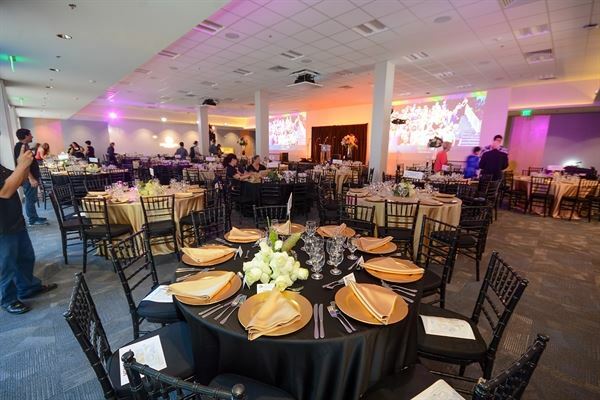 With various spaces from indoor, outdoor, lanais, concert stages, we will help you find find the right space for your event. Atmosphere/Decor: Open air space with covered pavilions which is great for socials and mixers. Special Features: This includes all spaces on the Sunset Lanai (Diamond Head Pavilion, Blue Lounge, and Ewa Pavilion. Atmosphere/Decor: The Blue lounge faces Honolulu Harbor with one of the best spaces for a sunset view. Situated in the heart of Waikiki, Hard Rock Cafe Honolulu is conveniently located within walking distance to many major resorts, a variety of shops, the Hawaii Convention Center, and the iconic Waikiki beach. Enter through the first floor Rock Shop, where you’ll find an array of collectible fashions and music–related merchandise perfect for souvenirs and gifts. Follow the sweeping artistic guitar wave up to an open air second floor area with veranda seating and a striking ocean-blue wave bar for a truly unique dining experience. Hard Rock Cafe Honolulu is the ideal location for you next special event. Our expansive floor plan and world class menu paired with our highly skilled event planning staff make us a fantastic location for your next private event. Forget boring business meetings and lame birthday parties, plan you next event with us and prepare to be blown away! We are a full service hotel located on the outskirts of the Waikiki strip. We have many banquets facilities that can go from meetings of 10 persons to social events up to 200 persons. Rooms have been upgrade and we will continue to upgrade services throughout this year. Pictures are coming soon. Tradewind Charters offers couples, families, groups and businesses beautiful charter vessels to host their special event at sea in the sheltered waters off the Honolulu Coastline. Full service means lots of catering menus, beverage & bar options, entertainment choices and charter times to choose from. Our vessels privately accommodate 6 guests, 24 guests, 49 guests & 75 guests so the right sized yacht is always available for your function. Kewalo Harbor departure is minutes from Waikiki Hotels with lots of free & $1/hr metered parking available. We host Corporate Events like Holiday Parties, Retirement Parties, Sales Incentive Cruises, Weddings and Wedding Receptions, Proposal Cruises for two, Bachelor and Bachelorette Party Cruises, Pre-Wedding Mixer Cruises , Memorial Services at Sea and Revisits of Ash Scattering release sites, Family Birthdays, Reunions, Anniversaries and any other Event you dream of. With 3,000 feet of shoreline overlooking Hilo Bay, WEC is the ideal location for your dream wedding , special celebration or meeting. The manicured grounds are framed with royal palms and swaying coconut trees overlooking serene Hilo Bay. A convenient property located less than a mile north of Downtown Hilo along the historic Hamakua coastline and minutes from Hilo International Airport. WEC was once the Hilo Sugar Mill and renovated into the home office for C. Brewer & Company. In September 2012, the Edmund C. Olson Trust acquired the two-story, 12,000 square foot building. The property encompasses the 12 acre surrounding property.